Posted on July 21, 2017 at 7:28 pm. Women Coming Together in the Name of Beer! 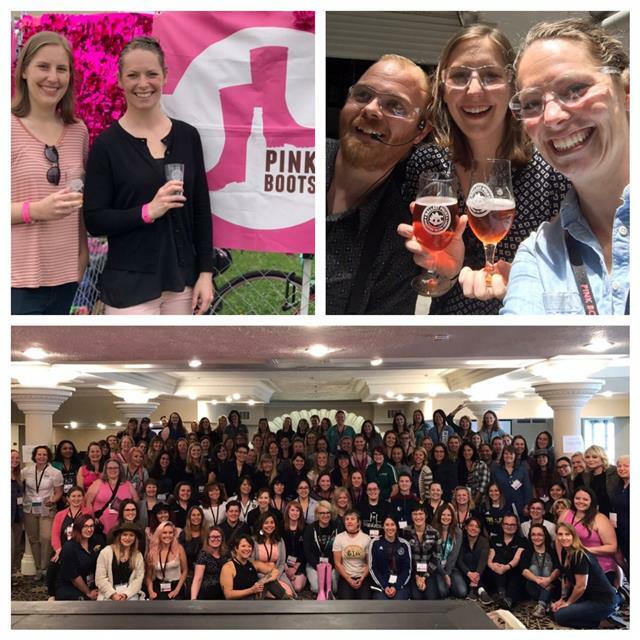 A couple of weeks ago I had an amazing opportunity to travel to and experience the Pink Boots Society’s first major conference. It was inspiring to see so many professional women amassed together in one room in the name of a shared passion for beer! This is a unique business to be in. It’s one of the oldest trades in the world. As a distributor, the beer industry is a way of life. I educate myself daily on the industry – new product launches, market trends, and consumer purchasing data. What I have not been able to do, previous to the Pink Boots Society meeting, is share my experience as a women in this generally male dominated industry with other women. Though here in Portland we have a strong presence of women within the distributor and supplier networks, we still make up a disproportionately small contingent of the workforce. This is why the Pink Boots event was such an extraordinary experience. After nearly ten years of distributor events and conventions, this is the first event I have attended that was geared specifically to beer and the women who, like me, dedicate their professional lives to the industry. For the first time, I had a chance to expand my knowledge in the trade surrounded by a group of my female peers. It was incredible!! We made new friends, we laughed, and we traded industry stories. Ultimately we bonded over our passion for beer and had a wonderful time doing so. We had the opportunity to hear a number of fruitful discussions ranging from Distribution, Sensory Recognition, to Hops as a raw material in the supply chain. The panels and lectures were enlightening and impressive. The Distribution panel was an especially valuable and enlightening learning experience for me. My understanding and compassion for the multiple perspectives on distribution that, previous to this discussion I did not have. I now have a stronger understanding of and increased empathy for the difficulties brewers have when deciding how and through whom to distribute their beer. It was eye opening, to say the least! The Sensory Lecture, by Gwen Conley, was amazing. Sensory recognition is the science of understanding what you are feeling, tasting and the perception you have. Simply put, she absolutely killed her presentation. She was engaging and funny and had her speech prepared, ready to go. She made me feel as if I were the only one in the room (though it was packed!). She gave exact definitions and examples of everything that Sensory Recognition has to offer. The most notable presentation of the event was the keynote speaker, Megan Parisi, of Samuel Adams Brewery. She spoke eloquently about her career path, starting out as a professional musician and defying convention in pursuit of her dream to be in this industry. Her inspirational tale of persistence in the face of adversity was refreshing not only as a fellow woman and manager in the industry but as a beer enthusiast. As a manager of a team, I found value specifically in her commentary covering what she deems her greatest accomplishment, watching the people she trained become exceptional brewers and move on to newer endeavors within the brewing craft. Her emotion and absolute passion for encouraging personal and professional growth within her team was palpable as she neared the end of her speech fighting back tears. This segment helped reinforce my belief that being a manager of people requires you to engage and build a relationship with them. Life is not just about numbers and making sure that you hit them. It is about the impact that you have on them as a professional. You could see the zeal that she teaches with and how she talks about her students. It was very moving to be in a room with a women with that much devotion. As leaders, we often don’t take the time to think about what kind of an impact we have on the people we manage or the impact they have on us as leaders. I hope that as my career progresses here at Columbia I can stand up and speak with as much passion as she has. And know that the passion was perceived on the other side. This was a great weekend for me. I was not sure what it was going to be like and or what to expect. To be honest I had no idea it was the first ever! The ladies of the Pink Boots Society did a fantastic job. I can’t wait for the next. The women I met and made friends with will be friends for a lifetime. I can not wait for our next adventure. Thank you Libby, for sharing your experience with us! We look forward to hearing more about your involvement with Pink Boots.